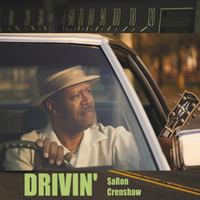 Legendary Blues guitarist and singer SaRon Crenshaw's first studio album, a two disc set featuring ten extended tracks. The album, Drivin', contains all original material by Crenshaw composed over the last few years. While Crenshaw is influenced by the likes of B.B. King, Albert King, Albert Collins, Stevie Ray Vaughan and Buddy Guy, he describes his playing as "blues with a soul twist," and Drivin' reflects this, incorporating influences from country-western music as well as R&B. The inspiration for Drivin' came when Crenshaw bought a vintage Cadillac, which he says, "would run for two or three weeks before it predictably broke down, costing me a fortune." The result was the title track, and a double record set of long format, live-feel blues, imagined to a backdrop of traveling the road with his beloved "Lucille" model Gibson (signed personally by B.B. King). Crenshaw has consistently been described in superlatives. Drivin' features Tom Larsen on rhythm guitar, James Odum on the bass guitar, Eric Finland on organ and piano, Jordan Rose on drums, and Wayne Tucker on trumpet. With the exception of horn parts, which were arranged and recorded at Avidon Audio Labs, the entire album consists of live, contiguous takes, done with no additional editing, overdubbing or pitch correction, and was mixed and recorded by producer/engineer Dev Avidon, using almost exclusively analog tools. The resulting sound stays true to the performance feel of live blues. Crenshaw has played with such legendary musicians as B.B. King and Robert Cray, has shared the stage with Denise Iasalle, Bobby Rush, Jessie James, Tyrone Davis and Chuck Robertson and was playing with Lee Fields and Roy Roberts before forming his own band, which is featured on this album. While he is currently on tour in Europe, Crenshaw plays regularly in the US at: Terra Blues Club, B.B. King Club, 55 Bar Christopher Street, the Shanghai Jazz Club and Smoke, among other blues venues and blues festivals. He was also asked to perform for former Vice-President Joe Biden. Drivin' follows his 2009 live album, Tight, Cranky & Loose. OneTrickDog* is a small independent label specializing in jazz, fusion and blues. The members are a collective of recording artists, sound designers, engineers, arrangers and composers. The label is affiliated with Avidon Audio Labs, which has tracked, mixed and mastered numerous contemporary jazz, classical and blues albums.